Don’t miss the giveaway at the end! One of the greatest gifts we can give our children is a strong foundation in God’s word. If you are looking for a bible study that gives your children the opportunity to truly make God’s word personal, then Grapevine Studies – Stick Figuring Through the Bible is for you! Grapevine Studies use a technique they call “stick figuring” in which students create an illustration of the scriptures being read aloud using stick figures to represent the characters. By creating these pictures, they bring the scripture to life and truly make it personal. Students are encouraged to be as creative and colorful as they like; whatever helps them to remember the scripture. If you need a little direction or want to model for your students, Grapevine studies offers stick-figuring examples in the teacher’s manual. In addition, this approach increases the child’s ability to retain the information because they are making connections to the scripture in multiple ways (hearing, seeing and “doing”/drawing). The Resurrection bible study begins with the disciples preparing for the Passover meal (the Last Supper) and covers the events through His Ascension in a way that is honest, but age appropriate. The best thing about Grapevine Studies is that you can customize each lesson to cover whatever you feel is appropriate for your student. You can also work at a pace that works for you. The Teacher’s book offers ideas for daily and weekly schedules, but again, it is completely up to you to decide what works for your family. Grapevine Studies organizes and presents the scriptures – but leaves the final choice of what to include in each lesson up to the parent/teacher. I love this about Grapevine Studies. In our case I chose to read more of the surrounding scriptures as Billy took his time coloring. Grapevine Bible Studies are available for every age level beginning with their new offering, Traceables, appropriate for ages 3-5. We chose this level for Billy to work with and he really enjoyed it. Created to allow younger students to work along with their older siblings, Traceables offer a “filled out” stick figuring box (with the stick figures in gray) on the student worksheets which young students can trace over. In our case, Billy wanted to color the figures more than trace them, but that was okay! By the end of the lesson he had truly made a connection with the scripture and did very well answering the review questions. That understanding was the goal of the lesson, not perfect tracing. With Easter just around the corner, I wanted to ensure that Billy knows the reason we celebrate. We spent lots of time during Christmas talking about the miracle of Jesus’ birth; and I wanted to make sure we gave as much attention to the reason that He was born – to die for our sins, and to rise again, defeating death. Thanks to The Resurrection study from Grapevine Studies, I know Billy understands the real reason that we praise God on Easter morning. He is Risen! 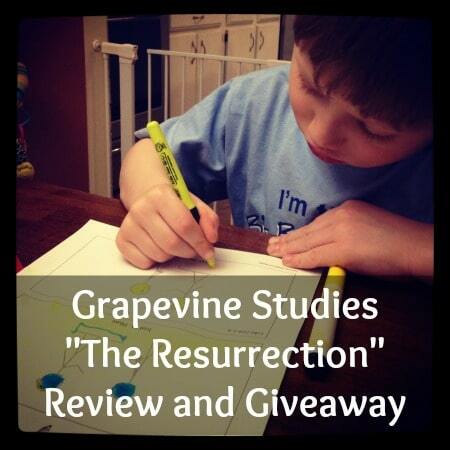 Click Here to check out The Resurrection and other studies from Grapevine Bible Studies. 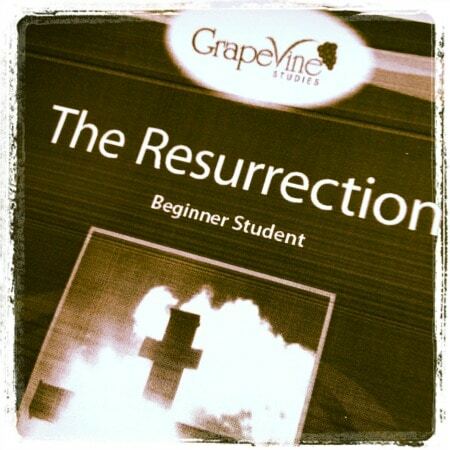 Enter to win a Resurrection Teacher and Student ebook set of your choice from Grapevine Studies! This looks like a wonderful way to keep the true meaning of Easter alive in the hearts of our little ones! I try to study a portion of the Easter story each week during the Lenten season. We do the Resurrection Eggs as well. Always looking for more resources. Thanks! We will start homeschooling on March 18th and I’m so excited to be able to incorporate bible lessons! I can’t wait! This will be the first year we really study Easter with my girls! Very excited! Thanks for the giveaway! Yes, we do Lent and Easter season here. We have done the tomb and cross craft. Hoping to do the ressurection eggs this year. This year we are observing Lent and going through a Resurrection study called The Messiah Mystery. It has been fun for the kids and we all have learned so much. Would love to do this with my kids. Thanks. I have not in the past but will do so this year. This would be a great addition! Since this is our first year traditionally homeschooling, we are planning to do so this year. However, we always do family activities together. We do study the Resurrection and this year my daughter and I are each participating in an Easter program at church. We use Grapevine right now for the OT and they’re awesome!! We read the resurrection story from the bible. We also have an Easter morning sunrise service at church. We haven’t as a homeschool, but we do as a family around the holiday. I have been wanting to try this curriculum. I’ve heard a lot of good things about it. I have had my eye on these studies for a while. I would LOVE to have one! We use the Resurrection Eggs and celebrate a Passover meal with a family Hagaddah. It’s a very special celebration for us! Yes, I try to focus some of our studies on Resurrection at this time of the year.